I am traveling this week on the west coast, but wanted to kick off Bathroom Blogfest 2007 with a marketing piece from a trip to the east coast, Washington, D.C. I must admit, it was my first pretense at potty photography. During a visit to the National Zoo, I visited their Ladies Room facility. 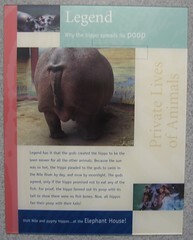 Once tucked safely inside the stall I was truly shocked to find the Legend of Why the hippo spreads his poop…!! Pretty neat marketing I think. A consumer in a private, confined space, is offered information, in a serious yet humorous way, about the company’s product. I wonder what kinds of fun facts and fiction libraries could share behind their restroom doors? You couldn’t have made that up!